Because of this, you can now write views that look like HTML rather than an unwieldy mix of HTML and C#. Now, here's that same form, using Tag Helpers. The normal HTML is highlighted regularly, and the tag helper HTML is in purple, making it really obvious which is which and hopefully negating some of the complaints I've seen about Razor being more obvious than Tag Helpers. Let's dive into some of these helpers to see how you can use them in your ASP.NET MVC 6 projects. That's just an anchor tag with two tag helper attributes. Notice that each tag helper attribute begins with "asp-", and their names make intrinsic sense to us: "action" and "controller". The properties "asp-action" and "asp-controller" are same as in the anchor tag helper, but notice the "asp-anti-forgery" property. Setting this to true is the same as using the @Html.AntiForgeryToken helper in Razor. This helper has simply made your views a little bit cleaner. Now there are many different kinds of input tags (e.g. date, checkbox, text, radio, etc.) and each kind had a different Razor helper. In the new tag helpers, there's just the input tag helper, with two attributes: "asp-for" and "asp-format". Again we see "asp-for" but now we also see the source collection specified using "asp-items." Easy. One odd thing I noticed about this is that "asp-for" doesn't require the Model. prefix, but "asp-items" does. If anybody knows why this is, I'd love to hear it. 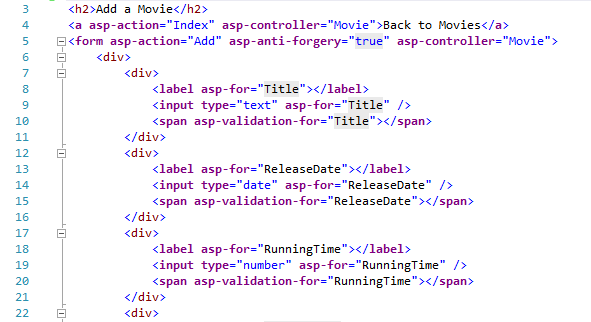 The final tag helper we see on the completed form above is the one on a <span> tag. This is an unusual one, since under many circumstances you won't want to use a span tag as anything other than a <span>. But wait, that's not all! There are several other helpers we can use. This helper is really interesting because the contents of the helper only get rendered if the HTML is deployed into specific environments. It does this by looking at an environment variable called ASPNET_ENV, and which you can set by right-clicking on the Project file and selecting Properties, then selecting Debug. I'm hoping there's an easier way to change this variable in the fully-released version of Visual Studio, but until then, this is how you use it. These are possibly the most interesting new helpers. There's a lot going on here. First, notice the values in the src attribute. Those urls point to the Microsoft Ajax CDN, a new (to me, at least) content-delivery network that holds many commonly-used production CSS and JS files, particularly those produced and maintained by Microsoft. In our case, in the sample project we get the script files for jQuery, unobtrusive validation, bootstrap, and others. But what about those "asp-fallback-src" attributes? They specify a second location that we can go grab the source files from should the first location be unavailable. In other words, we now have a fallback plan that allows our CSS and JS files to gracefully degrade over should the CDN (if we are using one) not be available. Finally, note that the fallback parameters are entirely optional. The content of the v attribute is determined by the content of the image; if the content of the image changes, so does the v attribute. This forces the browser to download the image again. This is a technique known as cache busting; writing code that forces the browser to download a resource (in this case, an image) if that resource changes. This technique guarantees that the user will always get the most recent version of the resource. In this sample, the WeatherReport partial view will be cached for 5 minutes, and will vary by the user. We can do this to significantly reduce load on the server as all of these requests will be cached server-side. What actually happens is that ASP.NET generates an ID that is unique to the context of the cached content, which allows you to have multiple <cache> on a single page and not have them interfere with one another. There are quite a few ways to control how the cache operates. Attributes include expires-after, expires-on, expires-sliding, vary-by-user, vary-by-query, vary-by-route, etc. You can use any combination of vary-by-* attributes on a single cache tag, and doing so modifies the ID that is generated for the cache. There's one major limitation to this tag: on the back end, it uses a construct called MemoryCache to store the cached content. MemoryCache is limited by the amount of memory available; once there's not enough memory to go around, MemoryCache will purge items until it has the memory necessary. Further, any app pool reset or server shutdown will destroy this cache. Basically, don't treat MemoryCache like a persistent storage solution, because it is not such a thing. 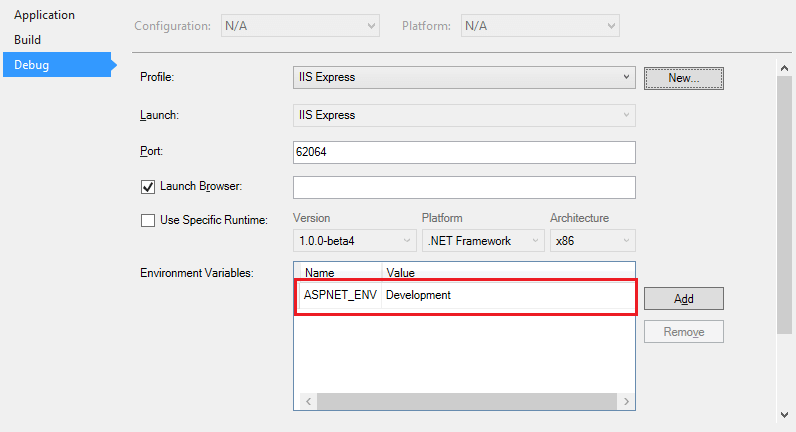 Today, let me show you a CRUD example with ASP.NET MVC and SQL Server. This sample demonstrates how to use the CRUD (Create, Read, Update delete) record in MVC in Visual Studio. We are using SQL server database for this demo.